This is a transcript of SYS Podcast Episode 062: Writer / Director Marc Lawrence Talks About His New Film, The Rewrite, Starring Hugh Grant And Marisa Tomei. Ashley: Welcome to episode 62 of the Selling Your Screenplay podcast. I’m Ashley Scott Meyers, screenwriter and blogger, over at sellingyourscreenplay.com. In this episode’s main segment I’m interviewing writer/director Marc Lawrence. Marc recently wrote and directed a film called “The Rewrite” starring Hugh Grant and Marissa Tormay. He’s had a long career in the entertainment industry starting out as a writer on the hit television show Family Ties and starting to write feature films in the 90’s and into the 2000’s. He had a big hit called “Miss Congeniality” in the early 2000’s and has continued to write and direct feature films. So we have a nice conversation about his recent movie and kind of how he got into the industry. So stay tuned for that. If you find this episode valuable please help me out by giving me a review on ITunes or leaving a comment on YouTube or retweeting the podcast on Twitter or liking it on Facebook. These social media shares really do help out so thank you, everybody, who does those. A couple of quick notes. Any website or links that I mention on the podcast can be found on my blog in the show notes. I also publish a transcript with every episode in case you’d rather read the show or look at something later on. You can find all the podcast show notes at www.sellingyourscreenplay.com/podcasts and then just look for episode 62. 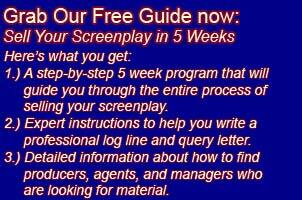 Also, if you want my free guide “How to Sell a Screenplay in five weeks, you can pick that up by going to sellingyourscreenplay.com/guide. It’s completely free. You just put in your email address and I’ll send you a new lesson once per week for five weeks along with a bunch of bonus lessons. I teach the whole process of how to sell a screenplay in that guide, how to write a professional log line inquiry letter, how to find agents, managers, and producers who are looking for material. It really is everything you need to know to sell your screenplay. Just go to sellingyourscreenplay.com/guide. Also, a quick plug about the new Sys screenwriting analysis service. It’s a really economical way to get a high-quality professional script evaluation on your script. All the readers have experience reading for studios, production companies, or contests. The readers I partnered with are the gatekeepers. They’re exactly the same people who are going to read your scripts at the companies that you submit to. The readers will evaluate your script on several key factors like concept and premise, structure, character, dialog, and marketability. Every script will get a grade of pass, consider or recommend. Also as a bonus, if you get a recommend from two readers, you get a free email and blast to my list of industry contacts. This is the exact same blast I use myself to promote my scripts and it’s the same service I sell on the website. It’s a great way to get your script into the hands of producers who are looking to make movies. Also you can read a quick bio on each reader and pick the one you’d like to read your script. Just go to sellingyourscreenplay.com/consultants to find out more. A quick few words about what I’m working on. The producer who has my low-budget horror script which I’ve mentioned several times on this podcast, the low-budget horror script that I optioned a couple of times to him, he has a connection with another producer who has a comic book property optioned. He called me the other day and wanted to know if I would write him a ten to twelve-page treatment based on this comic book. This is actually a pretty common situation. It’s basically the producer wanting me to write something for no up-front money on the slim hope that he’ll be able to get this thing funded. If this other producer likes our take on material, he may or may not hire us to write and produce this property so it’s highly speculative. But if you’re in Hollywood and you’re pushing your scripts around and you’re meeting producers, you’re going to run into these types of situations quite a lot. So I thought I’d just run through sort of my thought processes. Maybe it can help you in your own thought process and your own thinking as you get faced with these types of situations. So with this type of situation there are a couple things that I like to consider. (1) And this is really the most important thing to consider is who is the producer asking me to basically write something for free. In this case it’s a producer. I like him. He has quite a number or recent credits on his resume so I know he can get stuff done. This is very, very important because you’re going to get a lot of people asking you to do stuff for free that have no credits. A lot of these people are well-meaning and they might be hardworking but you really need to carefully weigh the value of doing something like that vs. the value of just writing something on spec for yourself and having that script to send out yourself. So that’s really the most important—that’s really the key. I want to make sure that I actually write the producer that I’m working with and (2) I want to make sure that this producer really is a real producer who has credits. And this guy’s got a bunch of credits. They’re recent credits. They’re films that are similar to some films which I have written so I kind of feel like our careers are at similar levels. He’s not too much ahead and he’s not too far behind me. This is important. You do want to kind of meet people and work with people who are at your same level or maybe a little bit above. That’s really going to be the best relationship. Ultimately, though, since this is no up-front money and it’s highly speculative, I basically know that I’m just doing this producer a favor which is just fine. As I said, I like him; he’s got credits and I feel like when and if he does get some money for a project, because I’ve been helping him out, he’s pretty likely to bring me on as a writer. He seems to like my writing. We seem to get along pretty well, and as I said, he’s got some real credits so I know at some point in the near future, he will get some movies funded and he will need some writers to write those movies to maybe rewrite, maybe he’ll have a script. Maybe he’ll have a property he’ll need some rewrites. So building a relationship with this producer I think is worth doing. I mean this business is all about relationships so at some point you’ve got to build some relationships and really try and foster them. So that’s kind of my thinking with this. The second big issue that I look at is how much work is this going to be for me? I actually don’t think writing a ten-page treatment will take me more than about six hours so that’s not, at least in my opinion, a lot of time to do something for free. You hear about this all the time where studios bring writers in to pitch on their take. I mean, you’re going to spend just for a high-level pitch meeting; you’re probably going to spend more than six hours kind of working this up. So I don’t think this is going to take that long, and there are a couple of reasons for that. I read the first three episodes of this comic last night and there’s actually a bunch more comments I have to read so there will actually be more material that I can draw from. But the thing is, just reading these first three episodes, I feel like there are some really strong story elements that I would be able to use in the script. This is important. I think in a lot of ways this is going to be like a big cut and paste job where I just take the elements from the comic. I’m going to need to restructure them. I’m going to need to combine some, throw some away, enhance them, remove characters, add characters. There are definitely going to be some changes but there are a lot of story elements that are already there in the comic so I don’t think it’s going to be like starting from scratch or it’s not like starting from just a simple half-page treatment and trying to flesh it out to a twelve-page treatment where I’ve got to come up with a lot of story beats. There is a lot of good material, a lot of really good visual action fight scenes, a lot of good stuff that I think will work well in a screenplay so it’s just a matter of combining them. Interestingly the first three episodes of this particular comic, that’s like one complete story. It’s one arc and looking at it I thought I originally bought those three comics and I thought that might be enough to flesh out to a full screenplay. Interestingly I think it could work as a screenplay those first three episodes but it’s actually very, very sparse. There’s actually not that much. I think these are only about twenty-two pages. I think twenty-two pages is standard. These seem like standard comic books. As I said, these first three episodes are one arc. I think it’s a good story with a good beginning, middle, and end. But it’s so lean and there’s not really that much there that I’m going to need to read some more of these comics and bring some of the other stories from other comics and try and combine them and weave them together to be able to flesh this out to a full screenplay and even a full treatment. That’s where I am with that. That’s kind of my thinking. As I said, at this point I’m going to go ahead and do this even though there’s no money; it is very speculative but I think it’s worth doing. I think it’s a fun project. That’s the other consideration that I do is how much fun is this going to be? Is this going to be enjoyable? If you’re not going to make any money off something up front—and in the entertainment industry if there’s no up-front money that means there is probably no money ever. So keep that in mind and don’t go into these things thinking I’m going to make some money down the road because I would say the chances of making money down the road are slim to none and I know that going into this. But I’m going to get to meet some of these other producers. I’m going to get to work with this other producer who I like. I think the project is a cool project. I’ve enjoyed reading the comics, and I think I’m going to enjoy kind of fleshing this out to a treatment. And I don’t think it’s going to take that much time. So combine all those things and it’s kind of a thumbs-up for me so I’m going to go ahead and try and whip up a treatment here in the next week or two. So now let’s get into the main segment. Today I’m talking with writer and director Marc Lawrence. Here is the interview. Ashley: Welcome, Marc, to the Selling Your Screenplay podcast. I really appreciate you coming on the show. Marc: It’s my pleasure, Ashley. Thanks for having me. Ashley: So to start out, I wonder if you can just give us sort of a quick overview of how you broke into the business. Take us through those post-college years as you got out of college, moved to Hollywood and broke in and kind of just tell us how you got that first break. Marc: I was a literature major in college, but I didn’t take any screenwriting courses or any film classes or anything like that. I always wrote but I hadn’t shown anything to anyone. I was writing sort of little skits and sketches and some really lousy short stories and that kind of thing. But I didn’t know anybody who worked in film and television; I didn’t know anyone who knew anyone who did it so it was not something that seemed like any kind of viable career path. So when I graduated college, I went to law school for a year and that was for me a less than pleasant experience. I got out of there. I knew (A) that I wanted to write and (B) that I would probably rather be living in a box on the street and trying to write than be a lawyer so that kind of set me up well for knowing what I wanted to do. How to do it was a little bit trickier. This was back in the 80’s and the Internet was not a thing so it was much harder in certain ways back then than it is now. I didn’t have access to scripts. I couldn’t go and watch the DVD’s at the office and watch the extras and hear writers talk about how they crafted shows and that sort of stuff. I bought a book that had I guess like screenplay format or script format and I went and started writing a script about my college experience and the off-campus house I lived in, and I finished the script. This was kind of pre-computer days. I mean people may have had computers but you didn’t see anyone walking around with laptops. I don’t think there were laptops so I was typing it and finished it and went and had about eighty copies made. And there was a book at the time called “The Writers’ Market” which I guess may still exist; I don’t know. But that had listings of every agency in Hollywood and Production Company and that sort of stuff. So I shoved them all into manila envelopes and sent them out and waited. And I think I got all 78 of them back unread, not even rejected but just unread and would not read unsolicited material. And then two of them got good reactions where two of them were read and people liked them. One was a fellow named Jack Rawlins who people may recognize from Woody Allen movies. All Woody Allen movies were produced by Jack, and he is just one of the great people in the history of show business, loves comedy writing for the sake of comedy writing. He called me and said “I like this. You want to come up and talk?” So that was one of the great meetings in my life, and he gave me the first screenplay I ever saw to read. And then the other person who read it was the person who turned out to be my first agent and she’s still an agent and working here in New York and we’re still close. Her name is Marsha Amsterdam. She liked the script and she said what do you want to do? And I said I guess I’d like to try to write movies and television. She said let’s start with TV because that’s shorter. She said what shows do you like. In college I really hadn’t watched much TV and she said go watch some TV so I got a copy of TV Guide which was how you found out what was on TV back then and circled every sitcom that was on and sat and watched it on a tiny little black and white TV and saw a show called Family Ties and liked it. I had to wait for the next week because there was no DVR or videotaping to see it again to try to write down the character names and get familiar with it and wrote a script for Family Ties and she sent it out to LA and Gary David Goldberg who created the show and Michael [inaudible 0:14:12.6] who was there writing and they liked it. I wound up working on that show for the next five years, of course, the whole run of the show and started out as staff writer and by the end was supervising producer. So that was the start and then from there I branched into movies but that was a great way to start because the show had an incredible cast. Gary was an amazing mentor and inspiration to writers and the show turned into a very substantial hit. We were on behind Bill Cosby and back then before there were a billion channels and you could stream and watch DVD’s and everything else, network television was kind of what people watched. So forty million people would watch the episodes. So it was a great incredible way to start. I started on the show at 24 so that was kind of the beginning for me. Ashley: No. That’s a great story. “The Writers’ Market” is still around. That was sort of my foray into screenwriting as well. We got into that book and it is still around and does, I think, have a section on screenwriting. So let’s dive into your most recent film, “The Rewrite”. To start out maybe you can just give us a quick log line for people who maybe haven’t seen the trailer or done anything about the film. Maybe you can just kind of pitch it to us. Marc: Sure. Hugh plays a screenwriter who won an Oscar for a very popular film in 1999 and had been the toast of the town. Since then bit by bit his career has gone downhill along with his finances and his family life. He was divorced. He has pretty much lost contact with his son, and the beginning of the movie we see him trying to pitch story ideas unsuccessfully to a bunch of executives who are all younger than him. With no options his agent finds him a job teaching screenwriting at a college in Binghamton, New York which he has never heard of. He has no interest in being a teacher. He doesn’t believe you can teach screenwriting, and the only reason he goes is because he’s out of money and he figures well, I can go there and not really do anything and get paid and write the next script. So he’s really out of options. And he heads out there and when he’s there, he meets people who will change his life from Marissa Tormay’s character who is sort of a blue-collar local single mom who has gone back to school and is taking his course to Allison Janney’s character who is a Jane Austin scholar and a professor who very much resents having somebody like Hugh teaching there to J. K. Simmonds, who is the head of the department who likes Hugh’s character but realizes he’s not yet a teacher and Chris Elliott is his next-door neighbor and a Shakespeare professor, and then, of course, he has the entire interaction with his screenwriting class who he initially chooses based on how good-looking they are on the university Facebook and eventually wind up actually getting involved with their writing and their creativity and their lives. That’s the sort of basic run-down I guess. Ashley: Perfect. So let’s dive into some sort of craft maybe lessons from this movie. One of the things your protagonist, Keith Michaels, played by Hugh Grant—one of the things about him is at the beginning he’s obviously a very flawed protagonist, and I didn’t feel like he was all that likeable or relatable. Now that set up a good transformation and a good arc. I’m curious, there’s always the conventional wisdom that you want the flawed protagonist which clearly this guy was flawed. But you also want to make him sort of likeable and relatable. I wonder just what your thought process was. Take us through that thought process of creating this character and making him not too completely unlikeable. Maybe just give us sort of your thought process when you were coming up with this protagonist. Marc: In my case a situation where I’ve discussed the movie with an actor, with Hugh in this case, and then he’s seen the script and wants to do it, that figures into some extent how you shape a character like that because I remember to go back to Family Ties for a second, Michael J. Fox played the character on that show, Alex Keton, who was sort of a slightly money-hungry Republican slightly elitist character and he was just beloved by people. There was a week where Michael was sick—or I can’t remember why—but we had to have a stand-in come in, an actor come in so that we could block and the rest of the actors could learn the show and we could get the shots ready. The actor was very competent and very proficient but it was strange because hearing those lines coming out of someone else’s mouth, the character just felt obnoxious and just completely unlikeable, and even though the show had already been on for years and was a hit, we went back to the writing room and we were really thrown like what should we do? How do we fix this and you realize that’s part of that interaction. So Hugh, by his nature and as an actor what he puts forth can make some of this stuff interesting and entertaining and likeable in a way that another actor might not. So the combination of knowing that yes, I’d like him to have enough flaws so it’s interesting and we can watch how he works through that over the course of the film, but at the same time I don’t want people to—They don’t have to absolutely be on his side at the beginning of the film—but I think that they have to be empathetic and actually, most importantly, be entertaining because if they’re entertained by him and his flaws, then they will go on the journey. So that’s really the thought process there and it really becomes just as a writer is it interesting to me? Is it entertaining to me? If it’s going over a line, I hope I know it as we’re moving through the script. So you’re trying to make those decisions as you go. He has an ill-advised relationship with a student that he’s teaching and that sort of stuff and you worry is that going to be too much for the audience? Will it turn people against him in the film, but it actually as you mentioned those types of flaws and problems are the things that wind up being the stuff of the film? So it’s always a little bit of a balancing act. I think you can probably look to characters and parts throughout cinematic history, you know, is Hans Solo so charming and loveable if Harrison Ford isn’t playing him? I don’t know. You’re always, I think, playing with that balancing act. Ashley: So just to be clear here, you have an idea for the script. You pitched it to Hugh Grant. He said yeah, I’d love to do it and then you went and wrote the script or you had a draft of the script and then you went and rewrote it knowing that he would be playing the character. Marc: In this specific case I told Hugh about the idea and he said that sounds interesting. He never commits to anything with me or with anyone as far as I know without reading the script. So I could have written the entire script and he could have read it and said yeah, it’s unfortunately not for me which was completely fine because I want actors to want to be in a film because they like the script not just because we’re friends or pals or we got along well at lunch. He knew about the idea and if he had said no, that idea is just not appealing to me, then I probably would have written the film anyway and just not have written it specifically for Hugh. But when he said yeah, that sounds interesting, that just meant if I liked the script when I see it, then I will do the movie. That was how this one worked, and actually I would say that’s how all of them that Hugh and I have done together have worked. There was never any kind of arrangement or understanding before he read the script. He might have known about the basic idea but there was absolutely no commitment. I actually prefer it that way. You want actors to do a script because they’re excited about that role and that part and not as an obligation or a favor or trading off of a friendship. Ashley: So a lot of people who listen to the podcast—obviously they’re trying to get into the business. They’re potentially struggling and trying to get their stuff out there—and one of the big thematic questions asked in this script, and you touched upon it in the pitch is this sort of idea of nature vs. nurture. I wonder if we talk about it we could talk about that for a minute. As someone who has been in the business for years, what are your actual thoughts on that? Can someone with maybe seemingly marginal talent actually succeed as a screenwriter? Marc: I guess you know the movie has a debate and I’m not exactly sure where I come out on it because I think it’s sort of an unanswerable question and one of the reasons hopefully that the movie is fun and entertaining and Marissa’s character is sort of on one side of the argument a little bit more and Hugh’s character on the other. I think there’s got to be some baseline of talent without which it’s going to be very difficult to make things work. I don’t know what that is or how you quantify it, and obviously it’s subjective. I guess occasionally there have been instances where people have a story, either something they’ve gone through in their lives or something that someone they know has gone through which is so unique and so special that even without necessarily being a very skilled screenwriter, the potential for that story is powerful enough that your script’s going to get bought in which case you probably will wind up being rewritten, but I’m sure that can happen. I don’t know what the level of talent is. I don’t think you can make—I guess for me the best analogy is music which I’m a failed musician so I can speak well to this and my son is an accomplished musician. He wrote the entire score to the film so I get to see it at home. If you don’t have an ear for music, I don’t think there’s any way to teach that. You can discuss all the theory you want to discuss and read all the books. It’s just not going to happen. So I think if you don’t have an ear for screenwriting, it’s going to be very difficult to make it happen. If you do and you love it, then I think you can absolutely get better and more skilled at it, and I think that there are wonderful books out there and teachers out there and I’m sure that’s all great. I didn’t have that experience in becoming a writer. I still think that at the end of the day, the best school for any writer is watching as many movies and/or TV shows and/or both that you love, that inspire you, and watching them again and again because I think that stuff sinks in by osmosis. I think you start to learn what works and what doesn’t work by watching those and analyzing them and where do the outbreaks come and how do they handle those kinds of things. And then the other thing is just to rewrite and don’t be easy on yourself because no one else will be easy on you. The wonderful thing about writing is that it’s as democratic as any profession that I can think of. You can live on a missile silo in North Dakota, if you write a script and someone reads it in LA and they feel like it’s an interesting story and something that they can sell and people will be engaged in, you’re in good shape. It doesn’t matter what you look like or what your name is or what your connections are. So in that sense, it’s a wonderfully democratic profession. But they’re going to be hard on it so you have to be hard on it. You have to write and rewrite and show it to people who you trust. It’s great if they’re writers or they have experience in the business, but even if they don’t, they’re just smart people. Let them read it and listen—you don’t have to agree—but listen when they tell you this doesn’t make sense or this is boring or I didn’t think this was funny or I don’t like this character and then go back and try more stuff. If you can, take whatever you’ve written and hear it read aloud. It’s great if you have friends who are actors or who work in a theatre group, but even if you don’t, get relatives together and sit around a table and read it out loud because it’s going to sound different and you’re going to learn things about it that you can never learn if you’re just hearing it in your head. The biggest thing is if you’re a writer, there are just no shortcuts; either you’re writing or you’re not working. I think whether you write alone or with a partner, it’s just spending the time doing it. It’s wrestling with it. It’s weeping; it’s wanting to kill yourself or throw it out the window and then going back to it and talking to whoever will listen to you. It’s all of that stuff and in terms of whether you have the talent to do it, ultimately it won’t be your decision; someone else will probably tell you. But if you love it and Woody Allen said that writers write the way institutionalized people basket weave. I think that that’s absolutely true. If you find yourself needing to write and going down every day in whatever constitutes your office where you write and doing it every day, then you’re a writer. There is no shortcut around that. Scripts don’t come out of thin air. You’ve got to be there and wrestle with them. It’s probably a long and not a relevant answer to your question. Ashley: No. I think it’ a great answer. I think that’s inspiring for people. So let’s go on. One of the big things in this movie was obviously it’s a story about a screenwriter whose kind of on the downward trajectory and watching this movie and knowing I’m going to interview you, I wonder how much of this is based on sort of your own experience. I’d be curious just to kind of hear obviously you had a big hit in 2000 with Miss Congeniality, one of the biggest movies of the year, and I wonder if you could talk a little bit about what does a successful screenwriting career look at ten or fifteen years after a big hit like that and just some surprises, some things that may surprise an audience of people listening and trying to get into this profession? Are there some things that surprise you after having the kind of success you’ve had? Marc: Well, you know, after Miss Congeniality came out the first film I directed and wrote was Two Weeks’ Notice and that turned out to be very successful. Then the music and lyrics after that was also quite successful. Then we did one called “Did You Hear about the Morgans” which was not and so that was an experience I guess that informed this little bit honestly from people who meet me and ask me what I’ve done. I hear about probably Music and Lyrics more than anything including Miss Congeniality. Before that this movie, Forces of Nature was successful so I was very, very lucky to have things going well. When you have one that doesn’t go well, it’s definitely an interesting experience and not one that you’re looking forward to so it hasn’t been exactly the experience that Hugh’s character had where there was just this one thing and then nothing else and Hugh’s character also wasn’t a director which is a whole other aspect of life in Hollywood. But I don’t know anybody who’s done it for any length of time, and I’ve been doing it—horrifying to say—for 30 years now from the time I started on Family Ties so I’m thrilled to still be doing it because it’s a hard town to keep working in for that long in some ways. But I don’t think anyone who’s doing it hasn’t experienced the kind of waves of everything’s going great; everybody wants me or nothing’s going great; nobody wants me. I think it’s just part of life in town. I mean, Bill Goldman in his books would do that great thing of writing, you know, the top stars from any decade and it was always interesting to see how few when from decade to decade would last with that kind of star power for a period of time. So that’s just part of what that world is, and it’s part of life moving on and it’s sort of what you sign up for. At the end of the day I think all that matters is following your instincts. I mean, it’s great to have hits and it’s great to make money and everyone needs to do that on some level. But no one—I don’t know anybody who started writing just so that they could make a lot of money and have hits. Everyone dreams of that but I think you write because you love to tell stories and you love the process of writing and it’s who you are. So regardless of how well or how badly things have gone, what’s great about writing is you wind up in that room by yourself wrestling with your own demons. And I think it’s a way to sort of keep pure. And the thing that you have to do—or I feel like I have to do—is to stick to and to be open enough to what changes in the world because when you do change in the world, you want to be open to new influences and seeing new things and seeing what other people are doing because most writers are inspired by other writers and other films. So you always need to keep those channels open, but at the same time not trying to follow trends because if you’re trying to do what whoever the hot new person is, you know, trying to do that, they’re probably doing it better than you can and in five or ten years or three years actually or a year in Hollywood, someone else would be doing the next new thing. So you need to kind of follow your instincts and do it for the reason that you got into it. I think anybody working, virtually anyone you can name, no matter how big they are can absolutely tell you about the time in their career where the phone didn’t ring and nobody wanted them and they couldn’t sell a script and that sort of thing. I think that level of insecurity is just a half an inch away for everyone in Hollywood regardless of how big you are I would say. It’s unsettling but it’s also I guess part of what keeps you alive and vibrant and striving and wanting to do better on the next thing. Ashley: Let’s just go back for a second. You were talking about sort of the writing process. Maybe just quickly take us through a script like the Rewrite. Take us through the process. You mentioned showing it to as many people as you can, getting actors to read it. I think it might be interesting for our audience to see what someone like yourself who’s been doing this for years, what they do with a script once they’ve done that first draft. Just walk us through that if you don’t mind. Marc: For me it’s a little bit easier because there was a deal in place and I was getting paid to write the script and so the producers, in this case, whom I’ve worked with many times, who did everything from Miss Congeniality, they’re commenting on each draft. I’m immediately getting feedback from the time I hand in the first draft, and they see it before Hugh sees it so I get their feedback. Then we work together, and then I’ll send it to Hugh and he’ll have notes. And then you send the script out to actors if you’re lucky enough to get them on board—which in this case we did—then my version of hearing it read aloud was with most of the actual cast. I think everyone in all the major parts made it to the reading. So you’re sitting around a table and you’re hearing it read. That’s a very important part of the process for me because you don’t have any of the advantages that movies give you. You don’t have music and you can’t edit and you’re not seeing fun visuals and able to cut back and forth between things. Movies in a certain sense are not meant to be read aloud around the table so to me it means if it’s working around the table, you have a fair shot at thinking it works in the film, and if it’s not, it’s a great way to sort of try to highlight that and try to figure out what isn’t working because it’s too late to fix it in a huge fundamental way once it’s up on its feet because you are just trying to then make the movie and deal with that. And I’ve had an instance of a reading, I think, sort of saving a film for me where hearing it read, I was really unhappy but there were a couple of moments in the script that worked, that this was not much before we actually started shooting the film where I was able to sort of circle those little moments and say that’s what this needs to be and then went back and locked myself in a hotel room and wrote for three or four days, went through the entire script. Didn’t change much structurally but character-wise an enormous change, and I think that resulted in that movie being relatively successful. So without the reading I think we would have been just out shooting what was there, and I don’t think it would have worked nearly as well. Ashley: So just to wrap up, you can tell us how can people see the Rewrite? Do you have some release dates, when and where it’s going to be playing and when it will hit the video-on-demand and that kind of thing? Marc: It opens on the 13th in select cities that are around the country. I know it’s in LA somewhere, and it’s also available on the 13th on video-on-demand and on ITunes and that sort of stuff so you can see it on the 13th. Ashley: Perfect. And what’s a good way for people to just keep up with you? Do you have a Twitter handle or a Facebook page, a blog, anything? Ashley: What’s your address? We’ll send some people over there? Marc: Or just wait for the next film. You can now put in a plug so you can keep up with my son, Clyde, who’s 21 and who wrote the score for the film and has been working with me. He actually wrote the theme song for Miss Congeniality when he was six. He has a band called the Clyde Lawrence Band that is very popular and touring colleges and on college radio stations and you can keep up with him. And he has stuff about The Rewrite up on his Facebook page. Ashley: Okay. Perfect. Maybe I’ll link to that in the show notes. Well, Marc, you’ve been very generous with your time. I really appreciate this, lots of great information. I wish you luck with this movie. I really enjoyed it and I think the audience will too. It’s a great movie for writers and that’s definitely the audience for this podcast. Marc: Terrific, Ashley. I really appreciate it and enjoyed talking to you. Ashley: Thank you very much. We’ll talk to you later. A quick plug for my upcoming class, I’m going to be teaching another Sys-Select class called Writing a Great Second Act for your screenplay. The second act is usually the most difficult part of writing a screenplay. It can be a real slog. Obviously the first act and the third act are incredibly important but if your second act doesn’t work, your script is going to be dead in the water. So if you’re having trouble with the second act, definitely check out this class. I’m going to be giving numerous tips and tricks about how to get through the second act and make it all work. I’m going to be reviewing the second acts from Legally Blonde and Back to the Future. Both of these are excellent scripts and both of them have excellent second acts. So there are a lot of lessons we can learn from them. I’m someone who really learns by seeing actual examples so that’s what I’ll be doing in this class with these two scripts is really trying to illustrate the points that I make. The class is going to take place on Saturday March 7 at 10:00 Pacific Time so if you’d like to learn more about this class, go to www.sellingyourscreenplay.com/classes. Also, if you’re listening to this after the class has taken place, no problem. I will record the class too and put it in the Sys-Select forum. In fact, all the classes that have been taught are recorded and are in the forum for Sys members to listen to. There are more than a dozen classes in there now. To learn more about Sys-Select, just go to www.sellingyourscreenplayselect.com. Again, though, if you’d like to sign up for this particular class or learn more about it, go to www.sellingyourscreenplay.com/classes. In the next episode of the Selling Your Screenplay podcast, I’m going to be interviewing Adam Greene. Adam is a writer and director and he even acts in some of his films. He’s written and directed films like Hatchet and Hatchet II. We talk about how he got his start in the business and how he got his latest film Digging Up the Marrow made. I mentioned in the last episode that Adam would actually be in today’s episode, and I ended up switching it. The Rewrite is out before Adam’s new film so they got switched around. Anyway, though, I promise the next episode will be Adam Greene. So keep an eye out for that next week. There were a lot of great take-aways from this episode with Marc. One of the big things I wrestle with myself is this issue of how much of screenwriting can be taught vs. how much can be learned. Obviously I teach screenwriting classes so at least on some level I believe that it can be taught or at least can be taught to some people. I consider myself a lifelong learner too. I learn a tremendous amount from interviewing these guests on the podcast. I still feel like I’m getting better as a screenwriter learning new stuff and I think the material I’m writing now is better than the stuff I was writing even three or five years ago. So I definitely believe that there’s a lot you can learn and you can always get better. But I’d really love to hear your thoughts on this. So what do you think about this? Check out any of the social media platforms and let me know what you think. You can leave comments on our Facebook page or YouTube channel or just tweet me something like something about this and use #sys62 and let’s start a discussion. You can find us on Facebook. It’s facebook.com/sellingyourscreenplay. It’s on YouTube. Check out our YouTube channel. Just leave a comment and let me know where you fall. Can screenwriting be taught or do you need to be born with the talent to do it? Anyway, that’s the show. Thank you for listening.